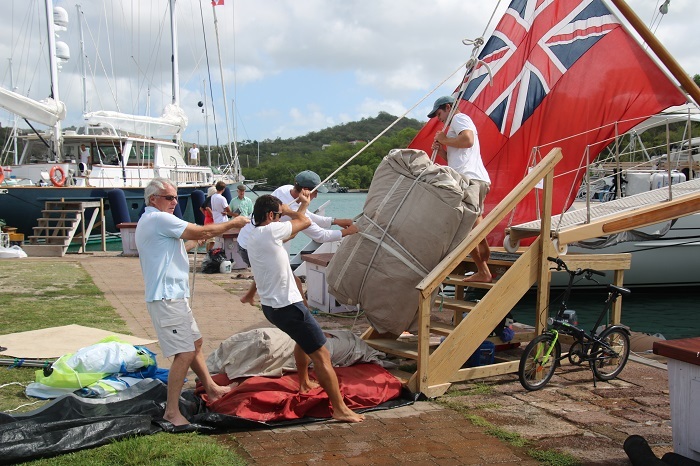 Last weekend I hosted an event, a Gam, for the Seven Seas Cruising Association (SSCA) for the 6th year. The event took place over a two day period and was a success, even if attendance was down a bit. It’s a big job to put on an event, big crowd or not and I have to say that as the date approached I thought “I am NEVER doing this again”. In the run-up to the event had made a big deal out of the planned USCG chopper search and rescue (SAR) demonstration that was to happen on the river and was sad to have it canceled at the very last minute because of bad weather. 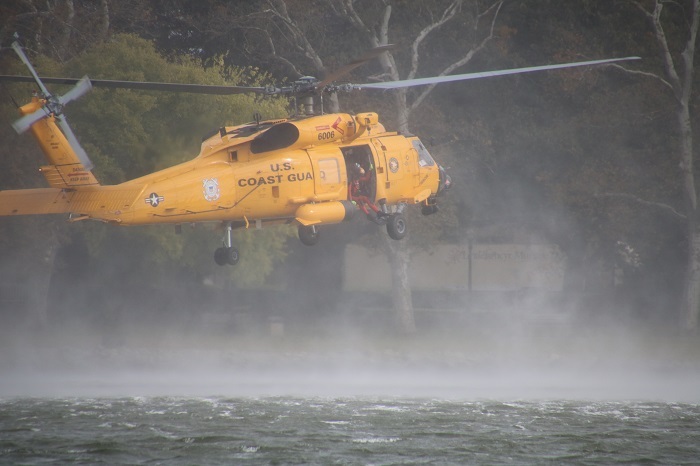 In “real life” the USCG goes out in terrible weather but for what is in essence a training exercise, they are more circumspect on considering the risk. I’ll admit that Saturday’s weather wasn’t ideal, with a lot of haze and a very low cloud ceiling. Oh well, there’s always next year. I think that the captain of the chopper felt as badly as I did as I was when she called me to share the bad news as she was keenly aware of how long I had worked on getting approval. It had taken THREE YEARS. At least I am persistent. Next year, the fourth.. Wait! I thought that “three was the charm”. Oh well. Anyway, chopper or not, they did bring a rescue boat and gave tours. The crew even stayed for lunch, flack jackets and all. It was fun and they made a big hit. Folks lined up at the dock for a peek aboard. I’d be thrilled to be rescued by these guys but it wouldn’t be so great to be boarded if I had something to hide. “Sir, just how much rum do you have aboard?” He looks like he’s all business. “But officer, all of these cases are just ships stores and for personal consumption. Really!” “Yeah, sure, over the next 100 years. 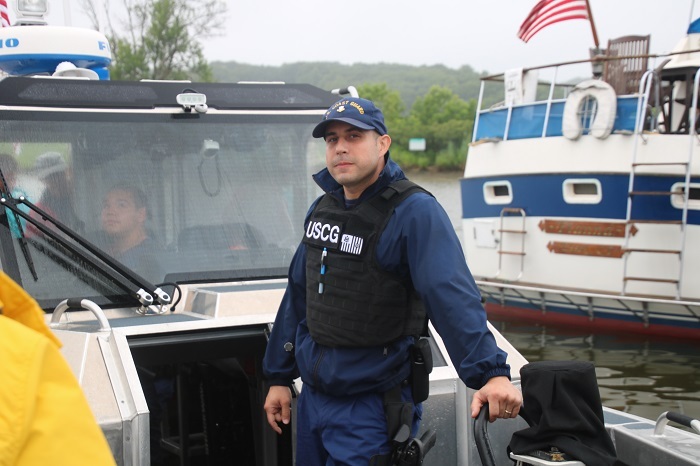 Can I see your documentation and passport please?” Every aspect of these boats are designed for tough conditions. And, blasting along at 45kts in rough conditions, these seats would come in very handy. “Pick me! I want to go for ride! I’ll even post photos on Facebook and write a blog post about it. I promise! 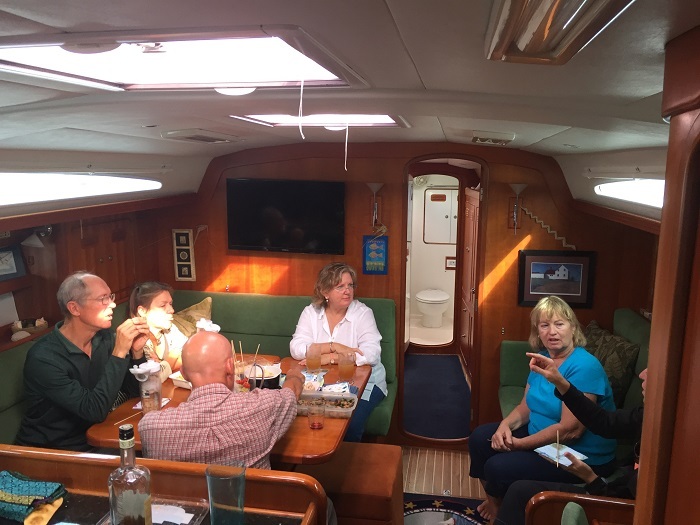 On Friday night, for the “early birds” Brenda and I hosted a get-together aboard Pandora. We had a fun crowd aboard. They filled the cockpit and then some. Some sat down below. There was plenty of food to go around. Many arrived in their “private launches”. I guess they sent their crew home early except the poor guy who was hugging Pandora’s transom. “Hey, you, crew guy, Stay in the launch. Buffy and Charles aren’t ready to leave just yet.” I wonder if anyone noticed Brenda’s most recent addition to Pandora’s decor? 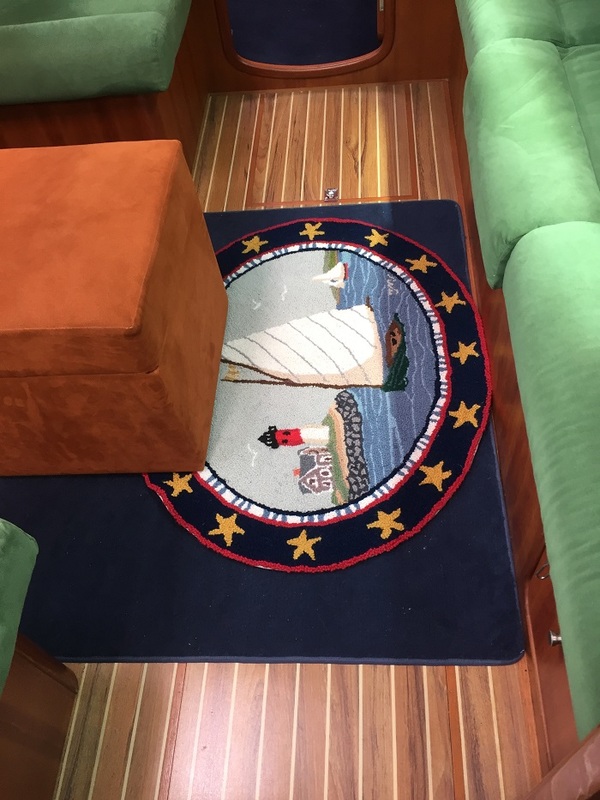 The rug pays homage to our roots as catboat sailors. Alas, just like every boat we’ve ever had, nothing quite fits. It’s lovely, never the less. So, the weekend was a big success and we had fun. After it was over my event partner George was just happy to sit and relax. 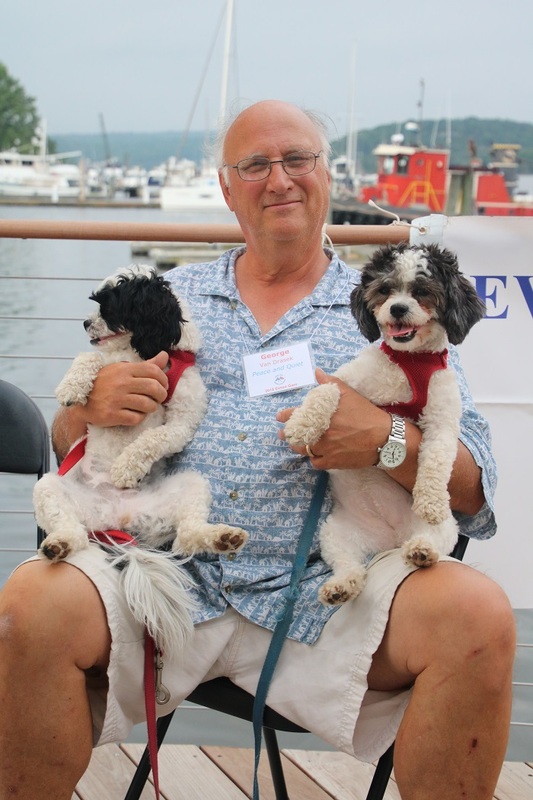 Everybody loves George, especially his canine buddies. “Can I have a cookie Dad! Please?” Does this guy look mellow or what? 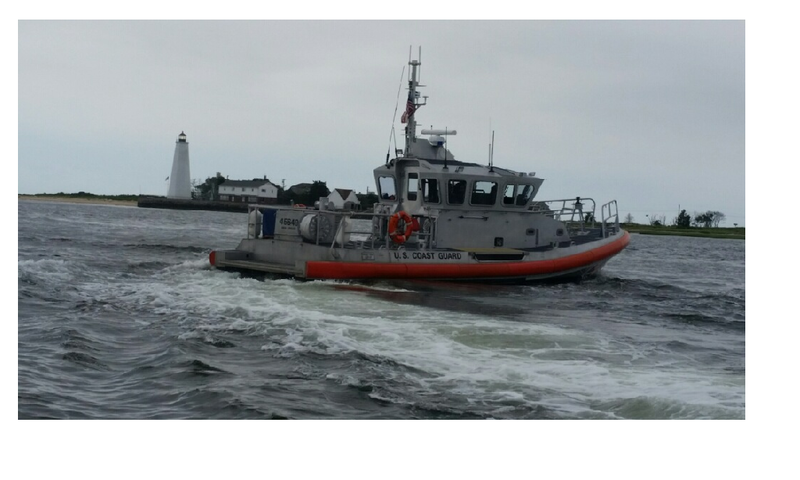 There you have it, the 6th annual Summer Solstice Gam has come and gone along with the weather that kept the USCG Calvary from showing us their SAR stuff. Such is the boating life where somehow it’s always about the weather. Better luck next year. Yes, me and the dog, ever hopeful. Perhaps 4 will be the charm. And speaking of the 4th, it’s Saturday and the 4th of July is just around the corner. Hey, here’s an idea? Let’s go hang out on the river? Yes, that’s the plan. Just us hanging out with thousands of our closest friends. The classic yacht, Marilee reenters our lives. 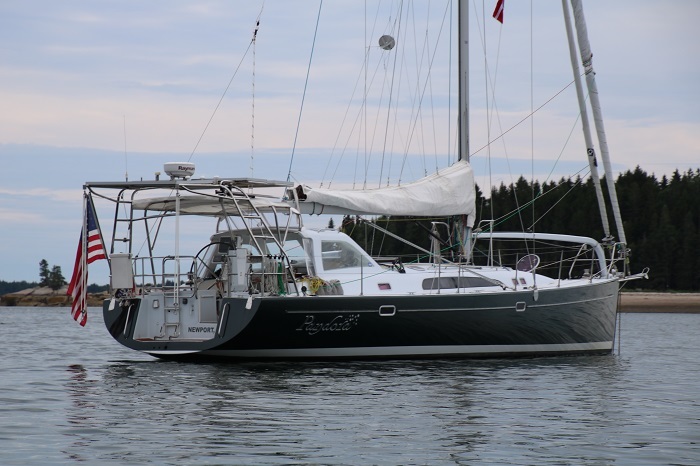 When Brenda and I purchased our very first boat, the 20′ Cape Cod catboat Tao in the late 80s, we kept her in Bridgeport CT and often sailed to Port Jefferson on Long Island and occasionally, destinations as far away as Nantucket and New Jersey. And let me tell you, that’s a really long way in a 20′ boat with a 5hp diesel engine. As all my photos of Tao are slides, and exist in a massive pile somewhere in the attic, I can’t show them here. However, I do have a photo of a painting that my good friend and artist Chris Blossom did for me as a birthday present way back in 1984. She was a beautiful, if tiny, boat and the closest that we ever got to owing a classic. Built in the late 70s, she was classic in design but modern in construction. I first spied the yacht Marilee, the subject of this post, in Port Jefferson in the early 80s, when we sailed Tao across Long Island Sound from her home port in Bridgeport CT. The ten mile sail seemed like a real journey back then with no dodger and only sitting headroom below. We’d generally set out from Bridgeport on a Friday evening to make our way to Port Jefferson, or “PJ” as we called it at the time. We’d rendezvous with friends and raft up with them for the weekend before heading back home on Sunday afternoon. 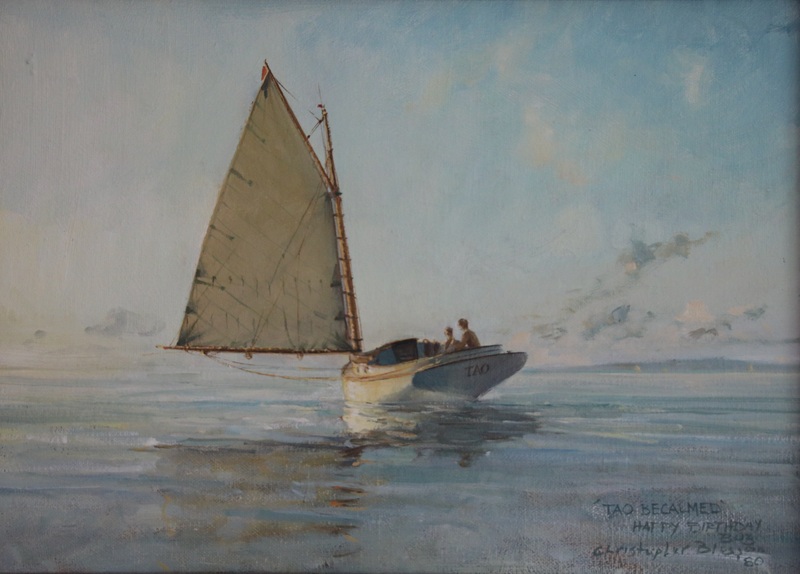 Some years later, when we all had young children and slightly larger boats, in our case, another catboat, a whopping 2′ longer, we’d designate one of the boats as the “kid boat” and the “adults”, such as we were, would sit on another, enjoying the relative solitude with the kids nearby but not underfoot. It was during that time that I first saw Marilee, anchored in Port Jefferson harbor with a big brown and yellow striped sun awning covering her decks. I never saw her under sail and expect that she wasn’t in good enough shape to head out anyway as were so many of the aging classics in those days. Brenda and I, some years later, became active as board members for The Catboat Association and were invited to a fundraising event in Tom’s River NJ, not far from our home at the time, also in New Jersey, as house guests of Peter Kellogg, the billionaire philanthropist and one of the supporters of Marilee’s restoration for the America’s Cup Jubilee celebration in Cowes England, home to the first race for what was to become the “America’s Cup”. Peter, at that time, was involved in a fund raiser for the A Cat class in Toms River and, as representatives of the CBA board, Brenda and I were invited to attend the event as his guests and stay at Peter’s summer home. 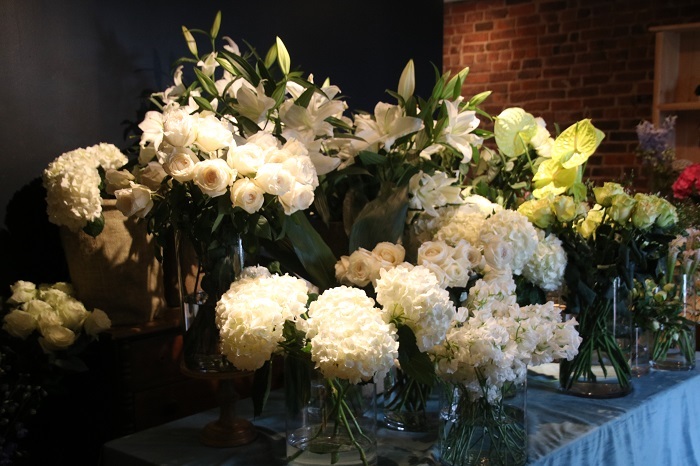 Even though he was no longer an owner of Marilee at that time, it was clear that he was still very proud of her as we saw all sorts of memorabilia including a painting of her that he had commissioned during his years as a part owner. So, once again, Marilee, sort of, came back into our lives. My dream,at the time, was that I’d someday own a “real” classic but as the years passed, and while we once came precariously close to purchasing an old wooden Crosby catboat, we became much more practical in our choice of boats which is certainly evident in current Pandora, which couldn’t be further afield from Tao. To be completely candid, Brenda is of the view that if I was truly “balanced” I’d have a little electric launch on the CT river and “stop with all that toing and froing, already” (to the Caribbean). But, that’s another story. And, speaking of Pandora, I have posted a LOT of photos in the past but it still seems right to me to put her up yet again for comparison. Anyway, back to my story. So, for the nearly 40 years since first seeing Marilee in Port Jefferson, I have continued to have an eye for beautiful yachts and am particularly drawn to those that I encountered from the deck of Tao. Now, many years later, some of these, and Marilee in particular, rejoin our world from time to time. I have written about many classics over the twelve years that I have kept this blog, and especially during our last two seasons in the Caribbean. With regards to Marilee, I was just “reintroduced” to her, now for a third time, the very same Marilee that I first saw from the deck of Tao so long ago. Marilee, is a member of the NY 40 class, designed by the Nat Herreshoff, the iconic yacht designer and was launched in 1926. 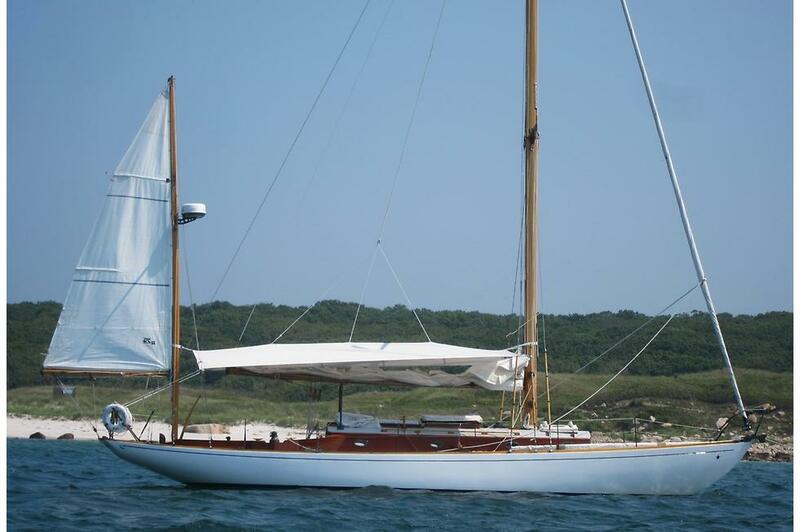 She is one of the last two hulls launched of the 14 in the class, built for members of the NY Yacht Club by the Herreshoff company in Bristol RI. 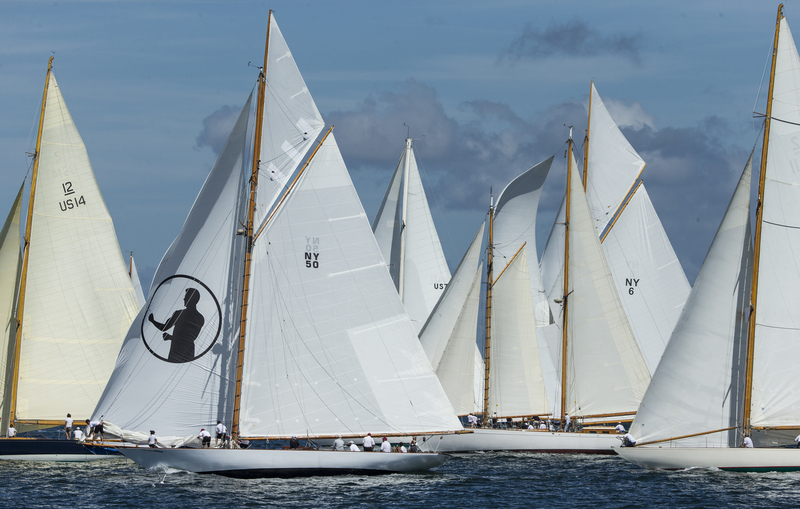 In the photo below, she’s the one with the “fighting 40” boxer logo on her sail. This was the informal name for the class when they were raced as one designs by members of the club. I found this shot on her “official” site . It’s an impressive shot and she’s clearly in good company. The NY40 class boats were raced by club members for a number of years but that was ultimately interrupted by the outbreak of WWI. By the time racing was resumed, the boats were sold as their owners moved on to more modern designs. Only four of these iconic yachts have survived and live on with owners who have pockets deep enough to keep these beautiful classics in prime condition, no simple feat. Marilee is one of these lucky yachts, perhaps the finest of her class in existence, and reentered my world, yet again, when I viewed a documentary film that chronicles her history and most recent restoration. 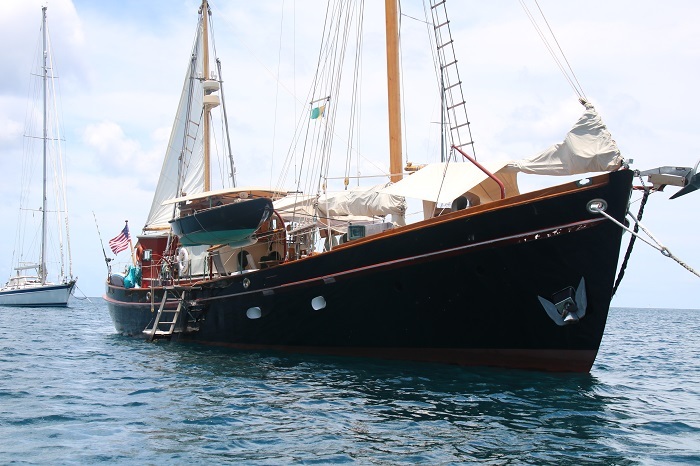 Those who follow this blog know that I make it a point to find my way aboard as many classic yachts as I can and while I have never been aboard Marilee, she has been in my mind as a very special yacht since our days of sailing our own “classic” Tao. 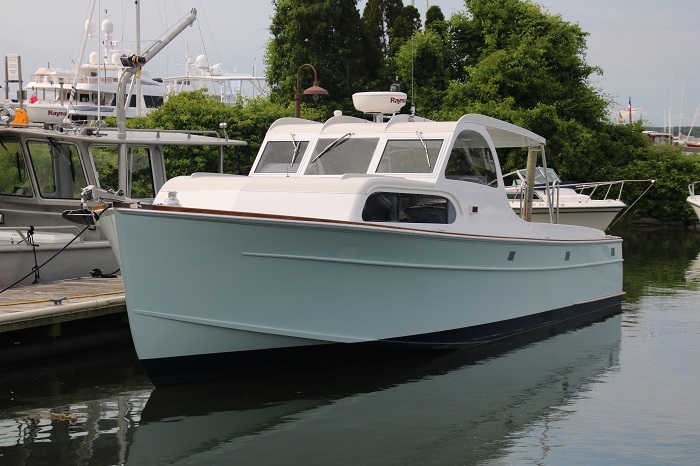 It wasn’t until the early 80s, around the time that John Wilson “launched” Wooden Boat Magazine, and, in part, catalyzed what has become a wave of restorations of many of the remaining classics worth preserving, like Marilee that she was brought back from near death. 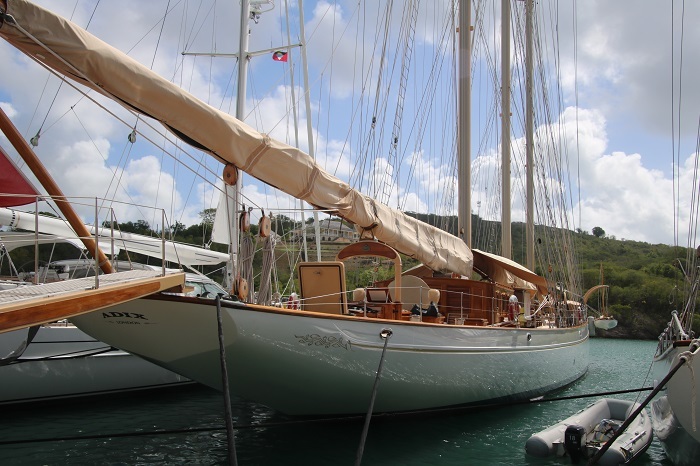 She underwent her first major restoration in 2000, funded by a small group of New York Yacht Club members, including Peter Kellog, in preparation for the America’s Cup Jubilee in Cowes England. She did well and won many races during that series. Fast forward to this morning when I saw that wonderful video chronicling her most recent restoration. Yes, I know that most restoration videos, a sort of “we replaced 40% of her frames…” type can be boring, but this video is particularly well done and includes fascinating historical information along with some details of her restoration. You should watch it. So, there you have it, a boat that I have never been aboard an yet still somehow feels like she has been a part of our lives for years. These chance encounters with Marilee are a lot like the cruising lifestyle, where friends come and go with the seasons. And while it may be months or years between those chance encounters, seeing them again brings back a wave of memories as we say “hello” yet again. For me, Marilee is one of those memories of times past. Our children are grown and have kids of their own and it’s nice to know that Marilee, that we first saw when we were newly married, is still out there and has a caring owner who is willing and able to put resources into keeping her in the condition she deserves. Want to go for a ride in a helicopter little boy? I can’t remember a time when I didn’t get a thrill when I saw a chopper flying overhead or spied one at an airshow. My late father, who passed a few years ago, worked for a company that published a magazine for the commercial aircraft business and highlights of my childhood included visits to airshows as a, sort of VIP, with access to some awesome machines. 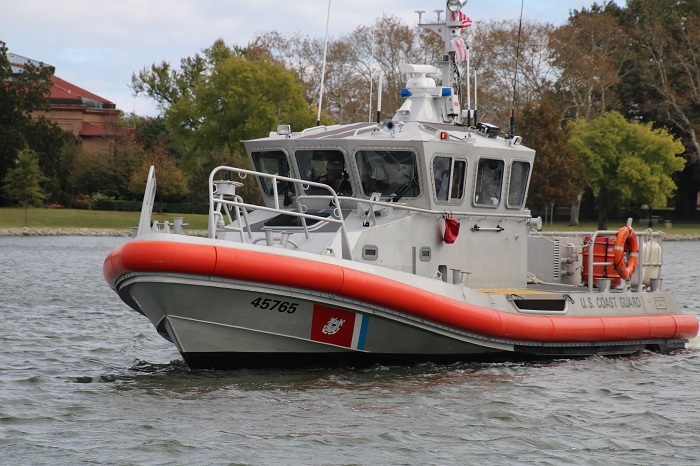 I am involved with a group that does sailboat rallies to the Caribbean, the Salty Dawg Sailing Association, and every other year in Hampton VA, prior to the departure of the fleet, the USCG does a SAR demonstration near the docks. I was there for the demo two years ago and to see the chopper hover and the crew doing their “rescue” was amazing. As a point of interest, this yellow chopper, all the others are orange and white, was commissioned to celebrate the 100th anniversary of the Service. As they hovered over the harbor, they kicked up massive amounts of spray which carried over the marina. 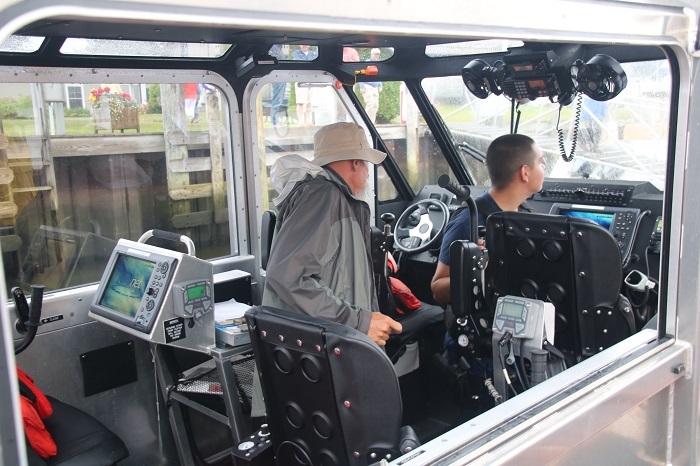 They also brought in a great little Response Boat to be sure that nobody strayed into the “drop zone”. Perhaps my fascination with flying, and with helicopters in particular, was fueled by Dad’s love of airplanes and especially WWII aircraft. Back in June of 2013, a few years before he passed, I happened upon some information about a super yacht owner who also owned a number of WWII aircraft and wrote a post about him, his yacht Marie and all those wonderful airplanes. In reality, it was a post for my Dad and to this day and nearly 1,000 posts, it’s still my favorite. If that hasn’t inspired you to click on that link, there are some awesome professional video clips of his planes putting on an airshow in St Barths a few years ago. That post led to Brenda and I being invited to visit Ed’s (the owner of those awesome planes) island in the Bahamas, twice, and sailing on his 200′ sailboat, Marie for three days. That proves, for sure, that you never know what life will lead to. Anyway, I digress… I mention all of this as three years ago I decided that I just had to try and arrange “my own” USCG “show” in Essex with one of their helicopters. I contacted the Coast Guard and asked about the process which turned out to be the same as if I was putting on a full scale airshow and wanted a military hardware to show up, which is to say complicated. Undeterred, I applied again the following year and it was approved…and canceled. Sigh… Ok, one more try. So, last October I applied for a third time. 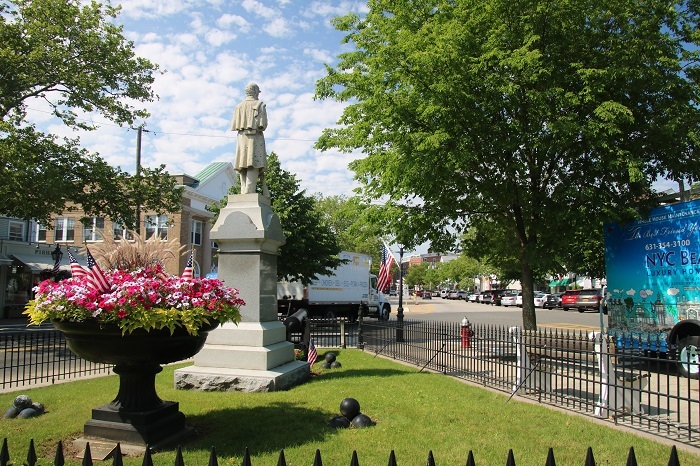 and again… declined because of safety concerns in busy Essex Harbor. However, as Brenda always says, “Bob and the dog, ever hopeful” and I appealed, sent a detailed annotated chart of harbor and drop area and submitted it yet a fourth time. 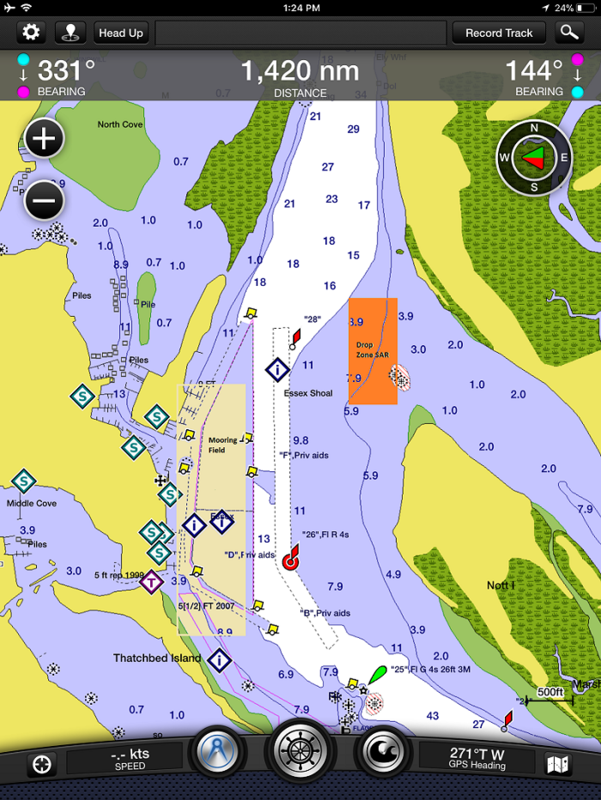 This is the chart I sent to the public affairs office showing the mooring field in brown and the “drop area” in orange. See, this can work. Right? Perfectly safe! I guess somebody with clout agreed and it seems that four times is the charm as yesterday I got word that the operation, chopper, 45′ Response Boat Medium, I prefer “cutter” and lots of Coasties, was approved for a Search and Rescue Demonstration. Yahoo! 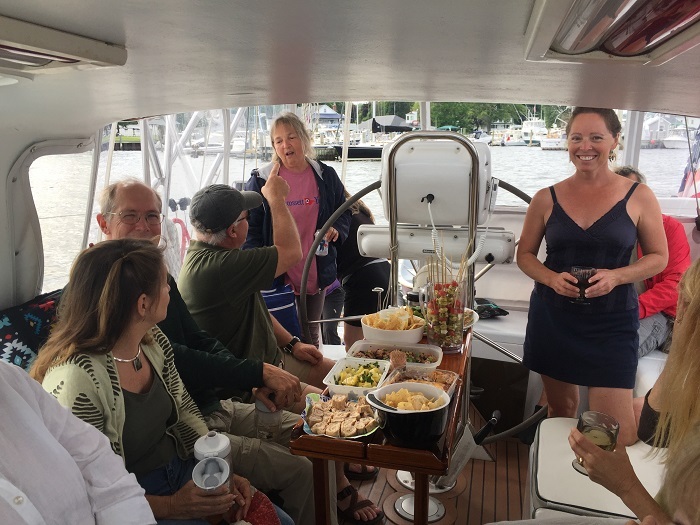 I mention all of this because this means that if you join us at our SSCA meeting on June 22nd to 24th at the Essex Yacht Club in Essex CT you will have a front row seat at this wonderful event. 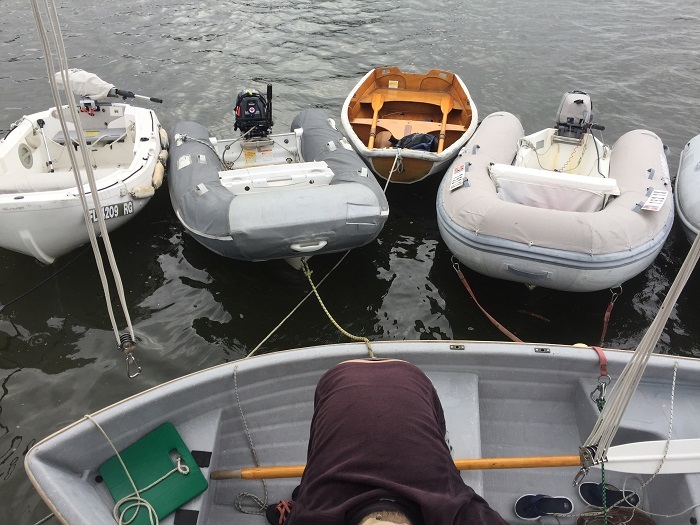 I have even arranged to have the 45′ “cutter” and her crew at the club dock and expect that the crew will join us for lunch and talk about what they do every day to keep us safe on the water. 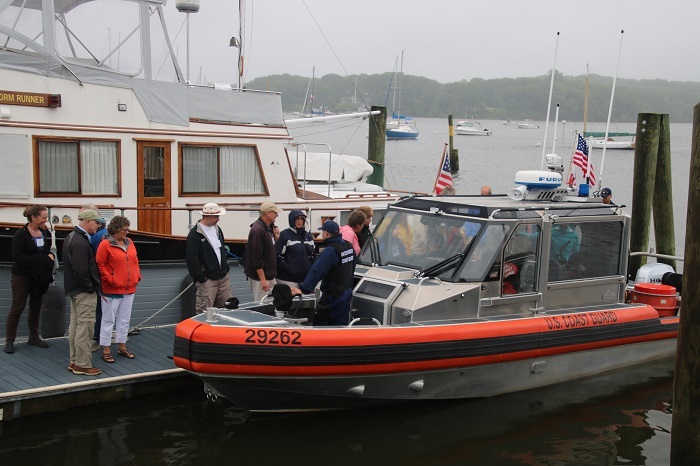 Here’s a photo of the boat that will be at the Essex Yacht Club dock for the event. And, this shot was taken at the mouth of the CT River. Perfect! I wonder if they will take me for a ride? Oh wait, I’ll be too busy. Perhaps a rain check. Unfortunately, the club grounds aren’t big enough to land the chopper though so we won’t meet the crew of the chopper. Don’t believe that I didn’t try to get that approved. You know me, ‘EVER HOPEFUL”. 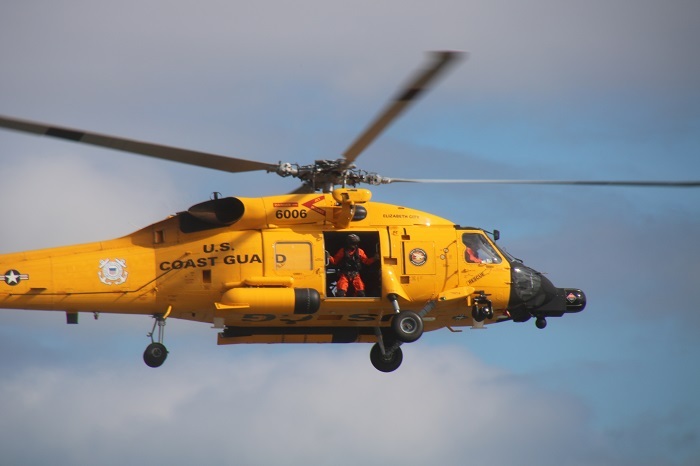 And, speaking of approvals, one of my USCG contacts told me that in his five years on the job, my event is the ONLY civilian SAR demo that he has seen approved. All of them were a part of a big event like an airshow. Go me! No… go SSCA! Well, the fact is that it’s all about my Dad who always told me “the worse that can happen is that they will say no”. Actually, sometimes just asking has gotten me into plenty of hot water but I won’t talk about that right now. And besides, he loved anything that flies and so do I. One more thing. Don’t forget to sign up. You’ll be glad you did. Besides, there’s much more fun to be had. Click here to see the full agenda. You’ll be glad you did. Don’t want to miss out? You won’t if you sign up here. Anyone who follows this blog knows that I am a sucker for beautiful yachts and to spend the winters in the Caribbean, especially in Antigua, puts me right in the heart of “classic yacht spotting” as many of the most fabulous sailing yachts in the world spend their winters there. It’s great that so many owners still gravitate toward the classic look in spite of an endless number of modern designs available to them. And, let’s face it, if you have endless funding, you can get just about anything that you might want. There is just nothing quite as beautiful as a classic schooner with a sweeping deck and towering masts. 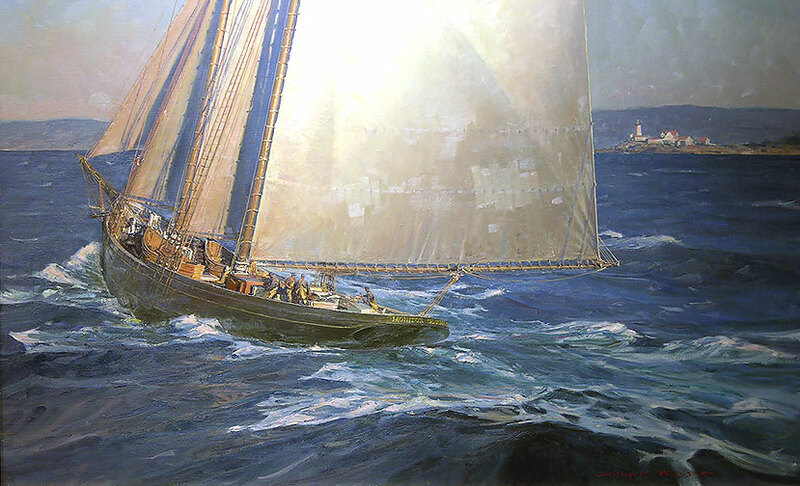 My good friend Christopher Blossom has painted images of many schooners over the years and while the age of fishing under sail is all but gone, images of these iconic yachts endure. This is one of many pieces that Chris has done, the fishing schooner Monitor. While there are a good number of modern interpretations of the classic schooners being built today, few are as close to their historic counterparts as the Columbia. 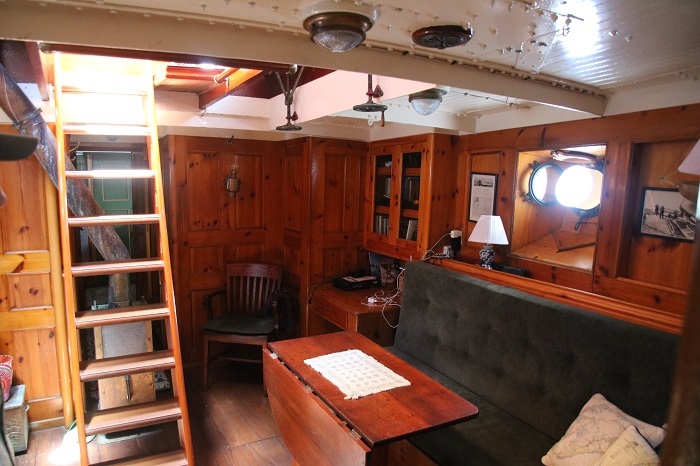 While she’s built of steel and her interior is thoroughly modern, (no smelly fish holds on her) from the outside she’s a faithful replica of her namesake, built in Massachusetts in the early 20th century. 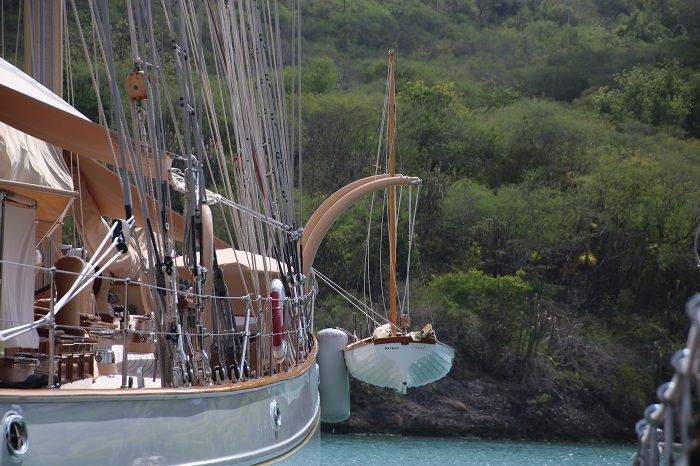 I have written about Columbia before and spent time aboard her in English Harbor Antigua this spring. Follow this link to my post about that visit if you missed it. I love learning the history of special yachts and it’s unusual to find a video of their construction. As Columbia was built in a commercial ship yard and, in this case, for the owner of that yard, this video is particularly personal. It’s worth watching. This video, about Adix, is worth looking at. 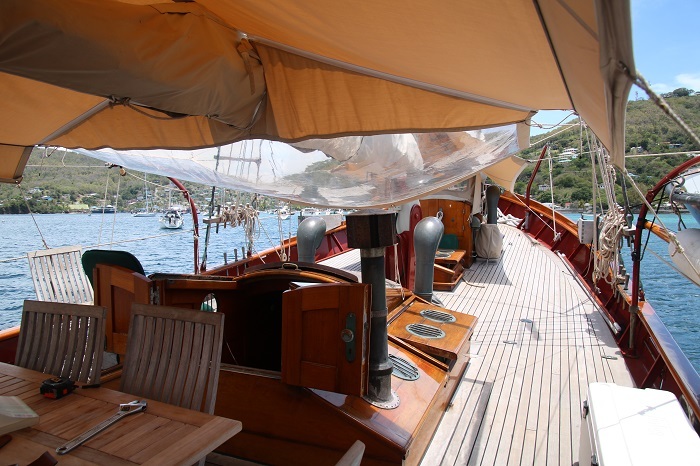 While she has classic beauty above the waterline, she’s a modern yacht below. Interestingly, in 1995 she was cut in two and an additional 15′ was grafted to her midsection. Sounds complicated. The video also includes a plug for bottom paint but it’s worth watching as it tells the story of a very unique yacht. While it’s months away, I am already getting excited about heading back south for next winter. I’ll admit that I don’t particularly enjoy the long passages but once I am there and Pandora’s anchored in Falmouth harbor, amid all those beautiful classics, the discomfort of the run south fades away. There’s lots to do between now and then including the remodeling of our guest bathroom. I wonder if the owners of Adix or Columbia concern themselves with such mundane stuff? Probably not. Knowing how much work goes into keeping Pandora looking her best I can only imagine what it takes when you own a yacht that was already a classic when she hit the water for the very first time. Oh, to be born a classic… If you don’t know what it’s like, you can’t afford it. Anyway, here we are in the heart of the Hamptons, the summer playground of the rich and famous. Sag Harbor, the “harbor” and town are up and running for the season but are still have an “off-season” feel because school isn’t out. When it is in a few weeks, watch out. Brenda and I went out for drinks last night and the bartender commented “it hasn’t gotten crazy yet” and said that the place would be jammed in a few weeks when school is out and everybody heads east for the summer. 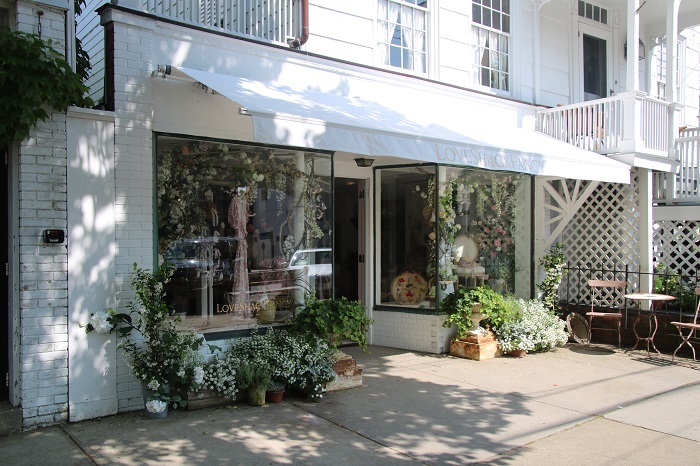 As it’s still early in the season, we are happy to enjoy a more laid back Sag Harbor. 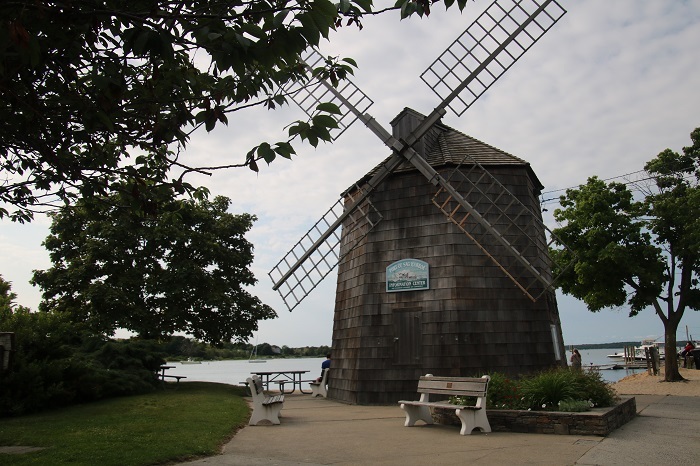 If you look at just about any promotional information for this area it will include an image of the town windmill, a modern reproduction of what was once a regular sight on Long Island before the advent of electricity. In “days of old” windmills were used to grind grain, pump water and many other uses. It’s nice to know that wind power and more broadly, renewable energy is making a comeback. Pandora has lots of solar power aboard, enough to satisfy just about all of our power needs, even heating water for showers and making fresh water with our RO system. 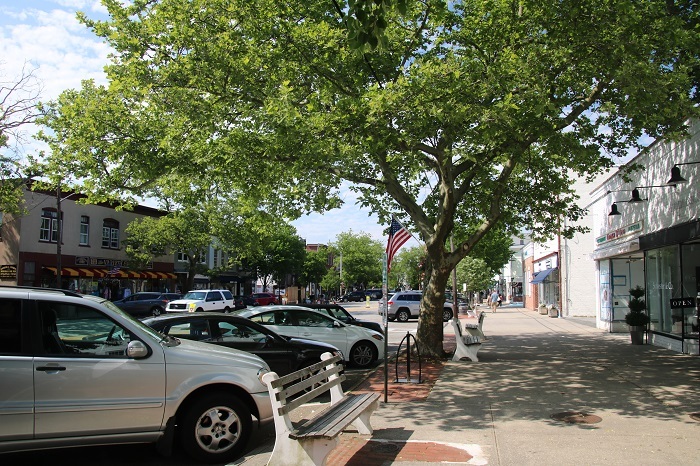 Tree lined and shady, Main street is about as pretty a place as you will find, especially before the summer hordes arrive. At the head of Main is a tiny charming park. Forgive the shot of the statue’s backside, but I just like this angle best. 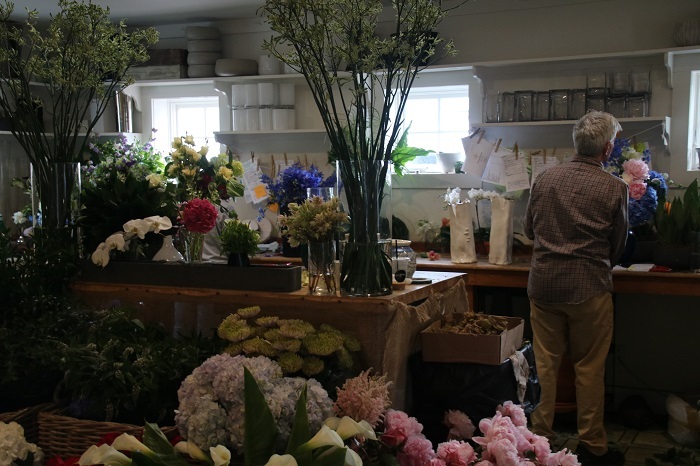 Shopkeepers can afford to put their best foot forward as their clientele are willing to pay extra to support a beautiful shopping experience. In one shop we found a small armchair that we loved. However, we didn’t love the price, $2,500. The shopkeeper was quick to point out that for a modest fee, they could ship it to us and we’d save the entire sales tax. Here’s a better idea, don’t buy the chair and save $2,500. 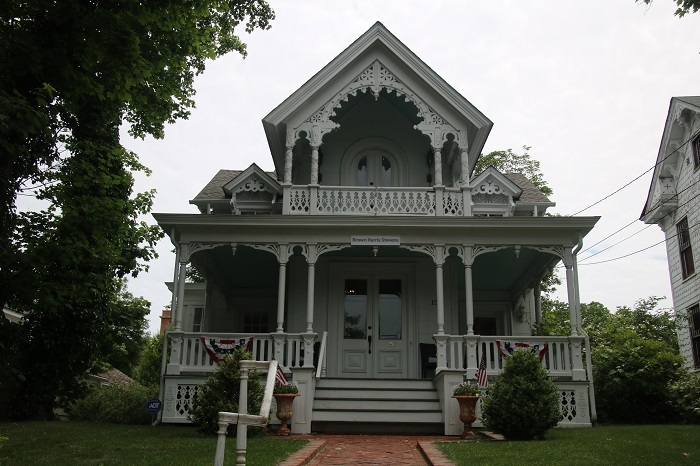 Charming architecture is everywhere. 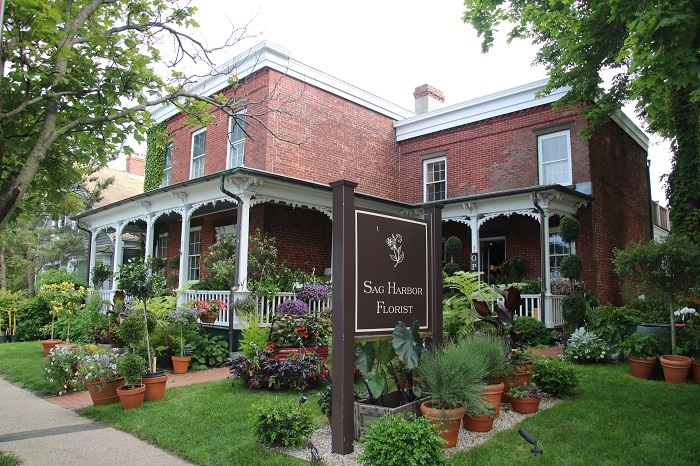 Note: It’s not the house that’s leaning… For us, no trip to Sag Harbor is complete without a visit to Sag Harbor Florist, from our viewpoint, one of the most beautiful florists you’ll find anywhere. Housed in a charming period brick building across from the waterfront park, it’s a perfect setting. Trust me when I say “you have to be there”. Their website doesn’t do the place justice. 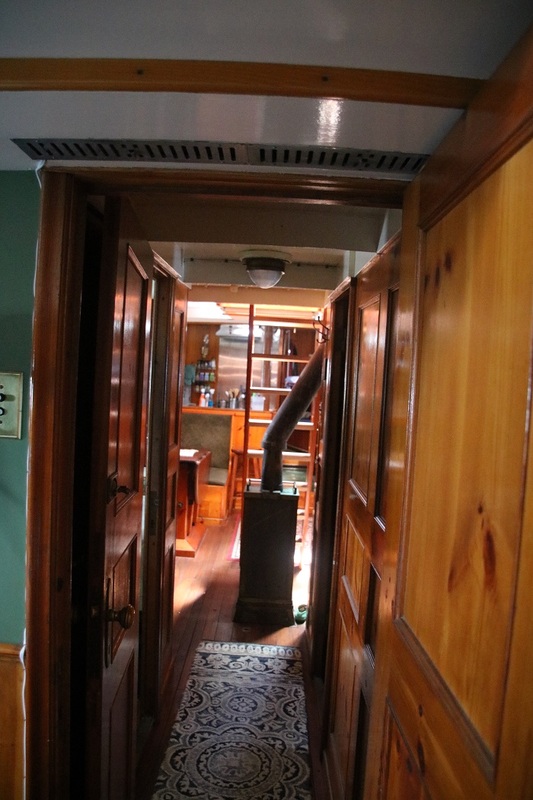 When you enter the shop, and there are multiple rooms to enjoy, the aroma is intoxicating. Imagine the scale of the home that can do justice to an arrangement like this. “Jeeves, be sure that the table in the entrance hall is dusted. 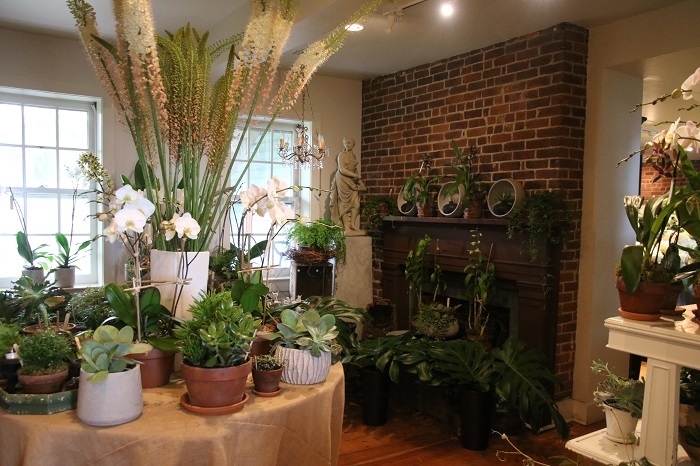 The’ll be refreshing the flowers today.” Imagine spending a day arranging flowers in this space? There is so much going on here every day that they often spill out onto the side yard as they prepare flowers for a big party, wedding or charity benefit. There just aren’t that many places in the country that have a clientele with the resources to support such high end business. To that point, Billy Joel, “Piano Man” and aging rocker keeps his boats here. I always make a point of checking out what’s on his docks. His taste in boats tends toward the look of a classic runabout and Rogue certainly fits that bill. I understand that right across the street from his dock is a building that houses his extensive collection of motorcycles. I didn’t have the nerve to try and peer into the windows. Oh yeah. One more thing. We visited our son and family last week. 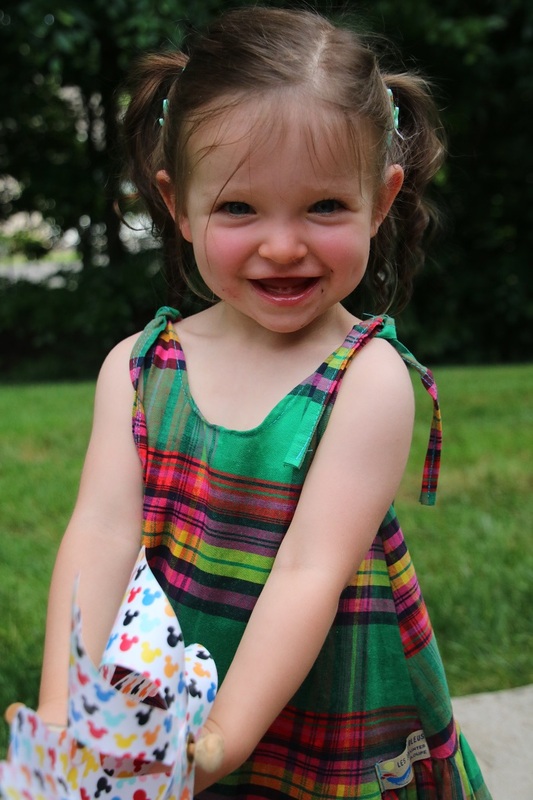 Our granddaughter is really growing up. I haven’t posted a picture of her in a while so here goes. Cute or what? Anyway, time is short and we need to enjoy the place before the hordes arrive and as this is THE place to be, they’ll be here soon enough. For several months last winter, Brenda and I cruised aboard Pandora through the Windward Islands, in the south east Caribbean. Along the way happened upon a lovely steel trawler in Le Marin, Martinique, Little Vigilant. I mentioned that sighting in a prior post but my only information was a brief glimpse and a quick photo as she motored by. I was bummed to only get a quick shot of her as she glided by and hoped that our paths would cross again. As luck would have it, we did see her again, a number of times actually. When we spied her in Bequia, I was able to get aboard for a tour by captain Earl MacKenzie, who was running her for the winter. He knows her particularly well as he had recently been the project manager for the first stage of her refit at Front Street Shipyard in Belfast Maine in 2017 and was clearly proud to show her off. Little Vigilant has an interesting history. This is what her Facebook page, has to say about her. It’s pretty interesting. It seems that she was originally conceived by her first owner, Drayton Cochran of Oyster Bay, NY in the late 1940’s. 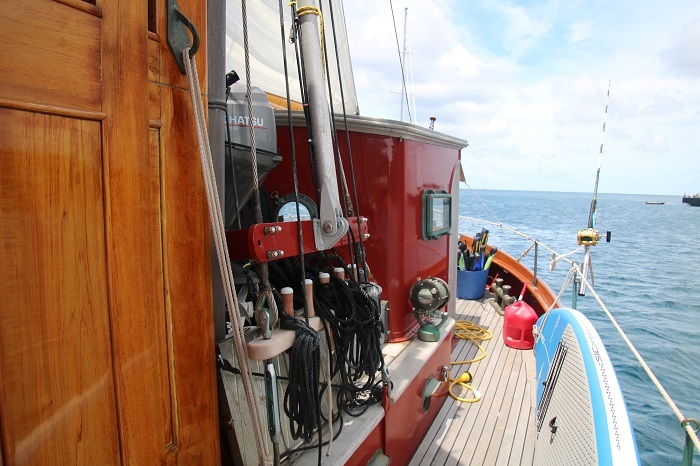 She is named after a much larger 110′ Vigilant, built in the 1930s, a sailboat I think, that he cruised widely. 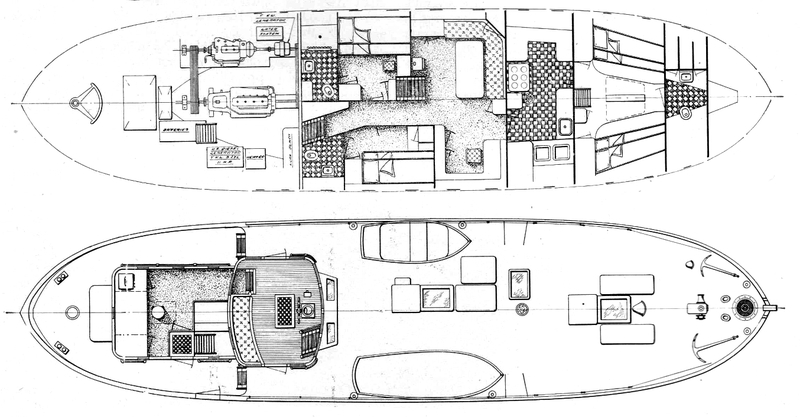 Unfortunately, I wasn’t able to find out much about Little Vigilant’s big sister but it seems that Cochran decided to downsize and commissioned Walter McGinnis of Boston, MA to design a trawler for summer use on the European waterways. She was built and launched by Abeking & Rasmussen in Bremerhaven, Germany in 1950, and used by Mr Cochran extensively during the next ten years. As an interesting footnote, Cochran is described by some as the “father of the Concordia yawl” as he was the one that approached A&R about building these lovely little yachts that remain so popular today. Clearly, he had a very close relationship with yard as he launched both Little Vigilant and his own Concordia yawl, both built by A&R in the same year, Shelia, now Duende, Concordia yawl hull #5. This photo is of one of her sisterships of this iconic design. Little Vigilant was sold in the early ’60s to her second owner, a wealthy British businessman and sat in a storage shed, I am tempted to say “barn find”, until 2004 when she was discovered by the present owner. She has a lot of work done on her since that time both in 2005 and again last year, the first stage of a multiyear refit. She presently hails from South Darthmouth, MA, which is doubly interesting as that’s where all the Concordia yawls were launched between the late 30s and 50s. 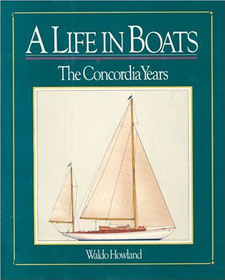 As an aside, the history of the much loved Concordia Yawls has been very well documented by marine historian Waldow Holand, son of the founder of Concordia Boat Company in Padanaram, MA. There’s even a wonderful book about the class that’s worth reading. However, I digress. So, back to Little Vigilant, also a product of the same builder that produced the Concordia yawls. This video about her most recent refit, is worth seeing. If this video seems a bit familiar, that’s because I used it in a post where I referred to Little Vigilant back in mid February. I guess I’ll just say if it’s worth posting once, it’s worth posting again as this is one pretty boat. 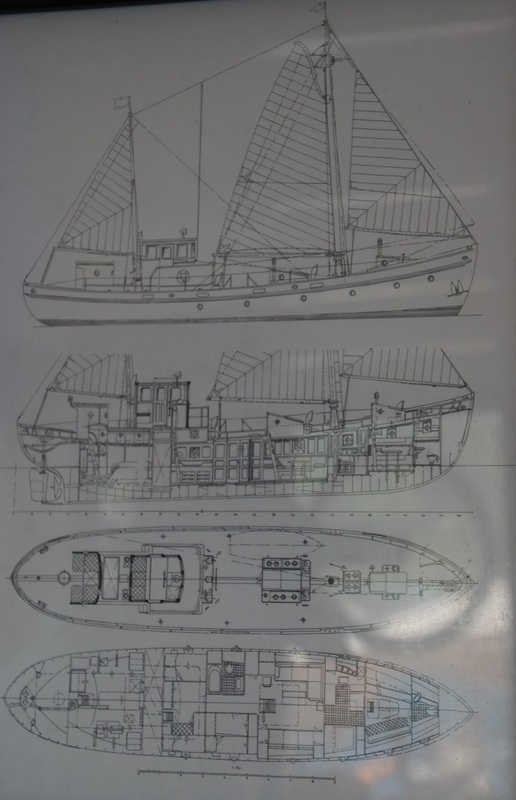 I found these plans for Low Tide, penned by Geerd N. JHendal (1903-1998), a yacht designer from Camden, Maine. The author of the post about Low Tide notes the similarity to Little Vigilant. 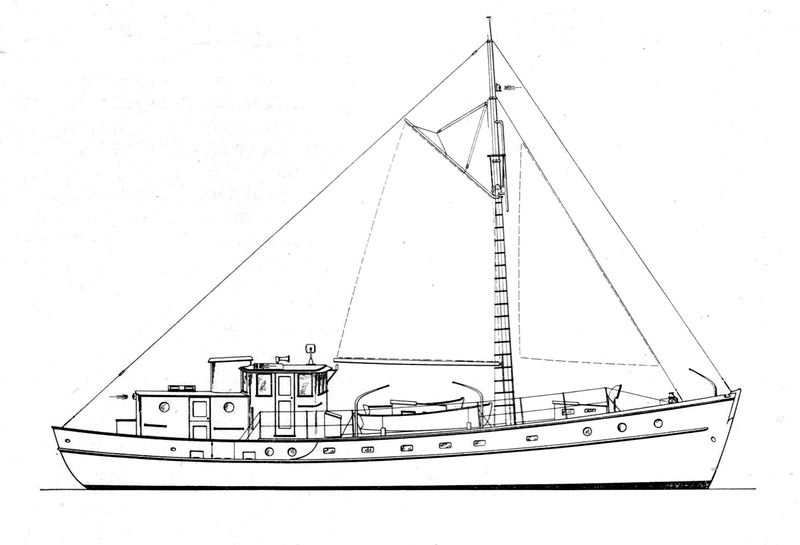 The drawings were published in The Rudder Magazine in April, 1948 and the author who wrote about Low Tide suggests that this design was an early proposal to Drayton Cochran for Little Vigilant (launched in 1950 to a Walter McInnis design). 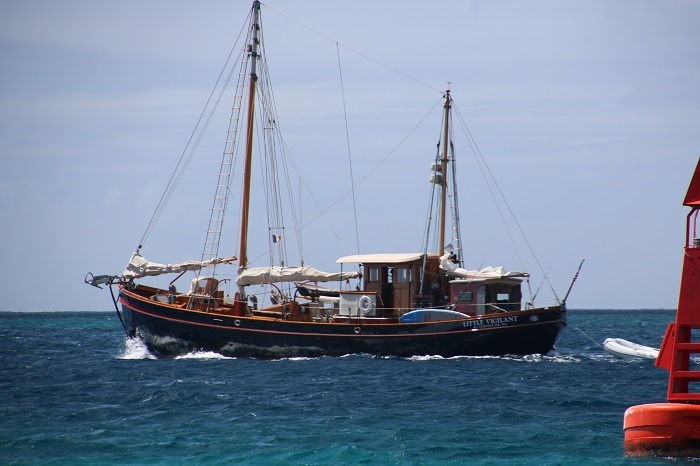 As I mentioned, I was lucky enough to have captain Earl give me a tour of her when we were in Bequia. She looked just wonderful sitting on her mooring on a beautiful “winter” day, sweet sheer and all. Just love the proper boarding platform/stairway. 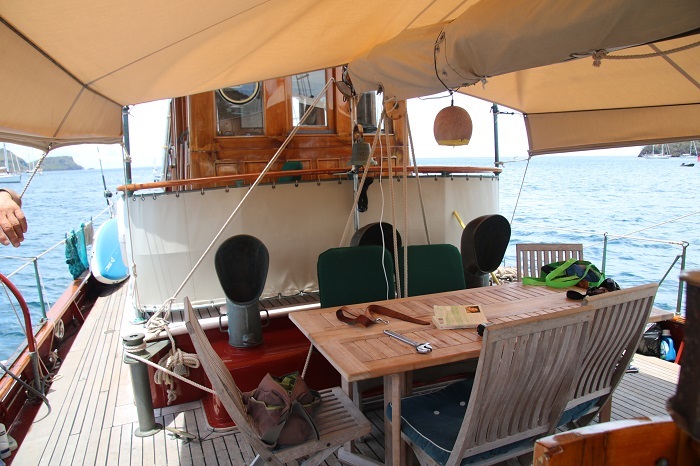 On the day I visited to introduce myself to Earl and his wife Bonnie, several of the owner’s family were visiting, all sitting around this table on deck, a very civilized spot to wile away the hours. The classic, Wind in the Willows would be a prefect read while sipping an iced tea at this table, I would think. Bonnie sewed the awning so they’d be out of the sun and wind. As there are brief showers and plenty of sun most days in the Caribbean, a cover like this would come in very handy. Note the vinyl section forward. It’s designed to be raised or lowered to keep out the rain or adjust the amount of breeze to adjusts to the perfect “zepher” when at anchor. How civilized. This is a pretty neat anchor lift that I believe Earl designed. 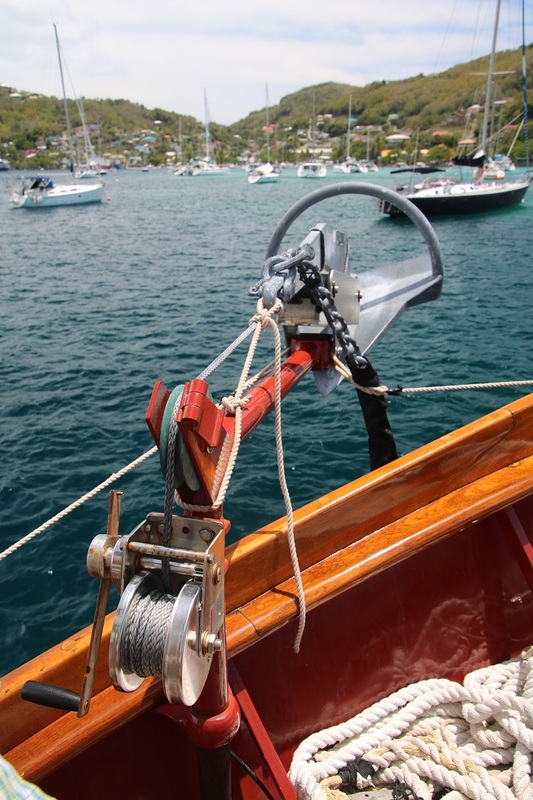 It doesn’t take the strain at anchor, just holds it up and secure when stowed. 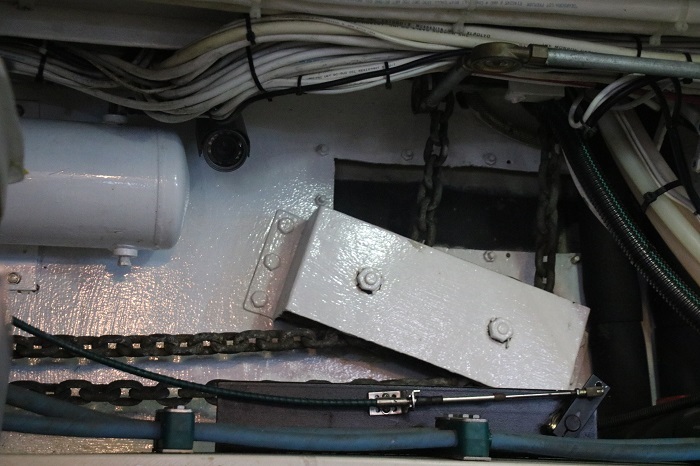 The fire hose threaded on the chain near the anchor is a nice touch to keep the topsides from being marred. 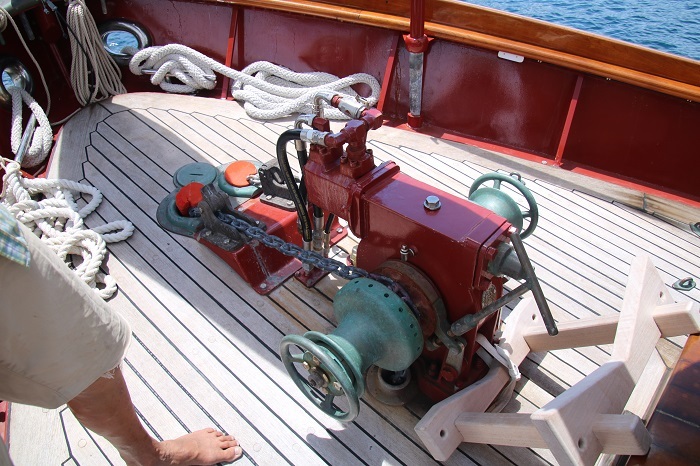 This is a serious windlass, original to the boat but rebuilt. The view aft looks like a great spot to spend time with a rod and line or just a nice spot to watch the world recede into the distance. 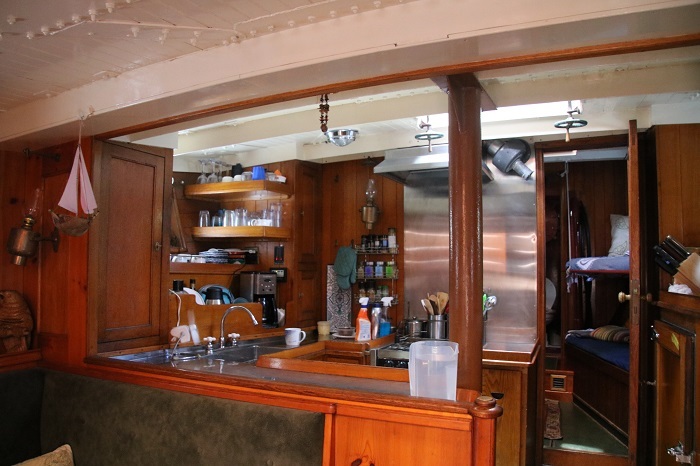 Inside the aft deck cabin, open to the stern, is a cozy spot to lounge while underway too. I didn’t take a picture of the deck cabin space as it was all torn up for the day as Earl was working in the area. You’ll just have to trust me that it is a nice place to watch the world go by. When she called the canals of northern Europe her home this salon would have been very cozy with a coal fire burning in her stove. Forgive the port list. Must be the photographer… These days she is also fully climate controlled with AC. Note the rivets in the cabin top. As is the case on any proper yacht, she has a framed set of plans displayed in the bridge. A very nice galley adjacent to the salon. 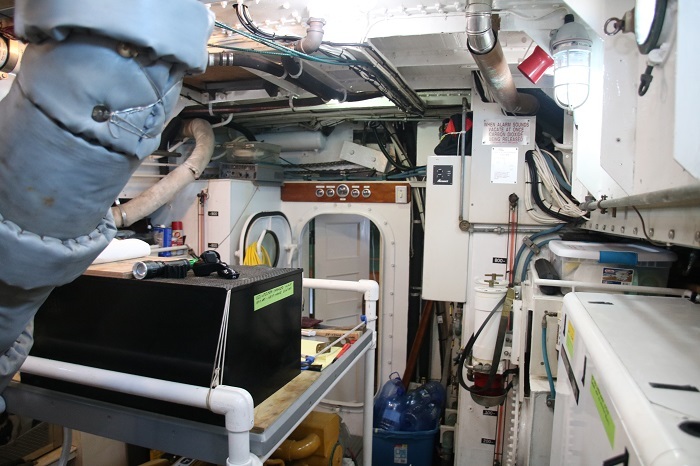 She has a serious engine room and with very good sound insulation, something that Pandora needs but doesn’t have. I don’t expect that this steering chain will break any time soon. It’s as rugged as the rest of her gear. Little Vigilant is a charming yacht and with additional refits planned. I expect that she will be even more lovely when our paths cross again, which I hope is soon. Little Vigilant is a charming little yacht with an interesting history and an owner who’s decided that it pays to be more than a little vigilant in keeping her in Bristol fashion for many years to come.